Mobile, Ala. ? The Bureau of Alcohol, Tobacco, Firearms and Explosives (ATF) in conjunction with the Mobile Fire Department-Arson Unit, request of any information pertaining to a firebombing case which occurred in Mobile. On Feb 15, 2015, at approximately 1:25 a.m. a pickup truck was firebombed at a residence off of Old Pascagoula Road near the dog track in Mobile, Alabama. There were no injuries as a result of this incident and investigators determined the fire started inside the vehicle. A glass bottle and wick were recovered from the burnt vehicle and laboratory analysis on the evidence indicated the presence of an accelerant. 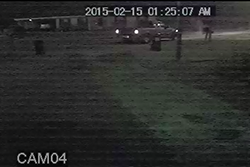 Security cameras in the area captured a video of a person/vehicle sought in possible connection to the firebombing. Anyone with information about this crime should contact the ATF at (888) ATF-FIRE or the Mobile Fire Department Arson Hotline at 251-208-MFRD (6373). ATF is the lead federal law enforcement agency with jurisdiction involving violent crimes of fire and arson. More information about ATF and its programs is available at www.atf.gov.